I am Gerdy and writing from Germany. Please excuse my English and used terms I could not get translated. 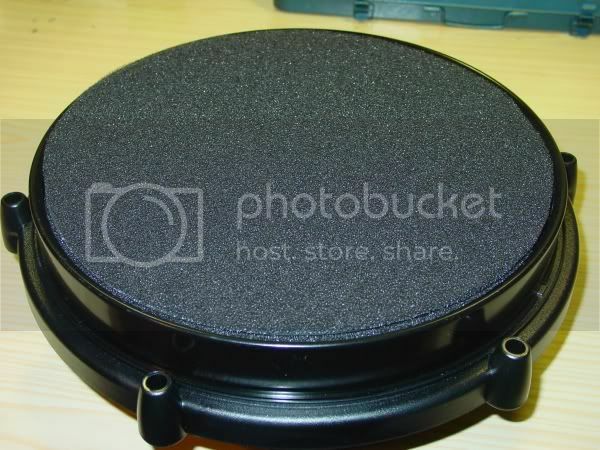 Today I would like to show you a mesh head conversion to the 12” pad coming with the X-kit. 12" pads from "Pro kits" are like the regular 8" and 10" pads and can be converted via Hellfire's mesh head conversion. This conversion took me one month since I received the X-kit. I tried several methods of the conversion using different materials and any kinds of foam I orderd from the internet and foam pieces bought from a clothing store. 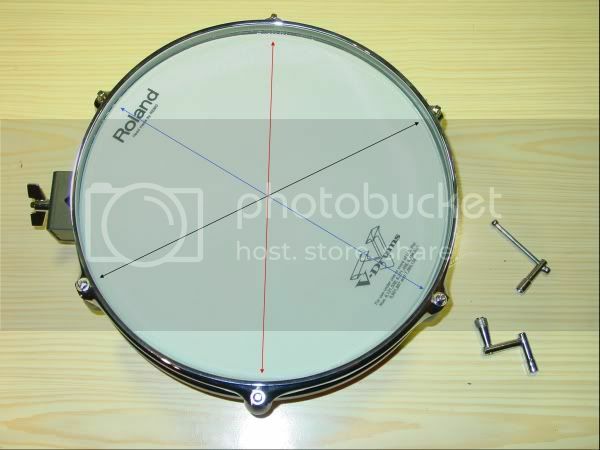 The most problem was the triggering of the rim piezo while playing on the drum head. Finally I found a very easy method which was better than I even expected. 1.) What foam do I need ? The foam comes as a roll of 2m x 1m / 78.7 Inch x 39.3 Inch. Thickness is 5mm / 0.2 Inch. The foam is very thin and fluffy, but it provides exactly the stability we need, believe me. 2.) What else do I need ? A scissors, a white sharpie / marker, a CD and of course the mesh heads. 3.) How long does it take ? During the instruction you can see how you can speed up the process by preparing all pads you want to convert. 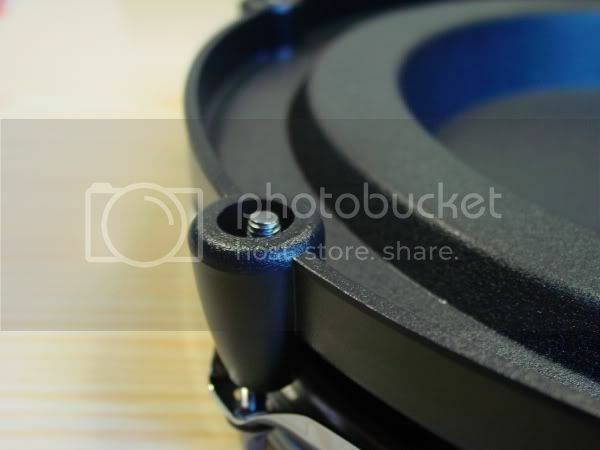 Open the 12” pad and remove the rim with the mylar head. Afterwards remove the 12” plastic shell. We are using the 12” plastic shell in the next step. That way we can speed up the process by opening all pads and afterwards putting them beside. Lay out the foam roll, take the 12” plastic shell and the white sharpie / marker and draft 3 circles of 12” on the foam. Afterwards take the CD and draft 2 smaller circles in 2 of the 12” circles. Every pad needs 3 foam slices: 1 closed foam slice and 2 foam slices with a CD hole. We can speed up the process by rolling out the foam and drafting all circles on it for all pads we want to convert. Afterwards we are cutting out the foam circles. This can be done with the scissors because the foam is very thin. Cut a slit in the foam slice with the CD hole and cut it out. That way you should have these 3 prepared foam slices for every pad. Now take the pad, lift the sensor/trigger plate very carefully and take a look inside. Be careful with the small trigger wires you see. Sometimes during the manufacturing they used too much of the yellow glue to fix the trigger sensors at the sensor plate and at the bottom. If there is a yellow glue strip between sensor plate and bottom you can cut it away with the scissors. Now cut a slit into the black foam and afterwards remove the foam very carefully. Again, take care of the trigger wires. The original foam is not need anymore. Keep it anyhow. You can speed up the process by prepairing all pads that way. Lay down the sensor plate to the bottom of the pad. Take the 12” plastic shell and place it on the pad. The notches of the plastic shell must fit with the knobs on the pad bottom. 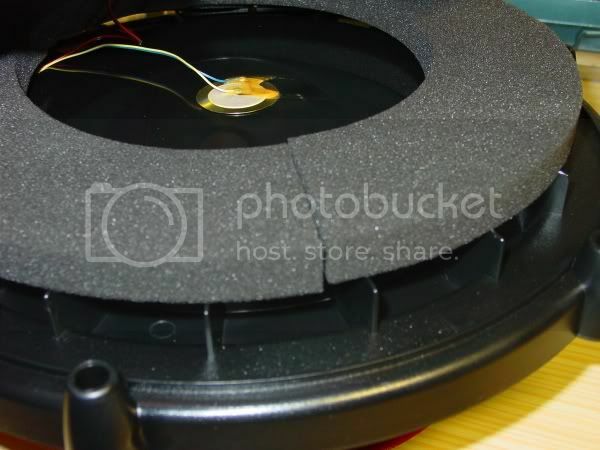 Now lift up the sensor plate inside the plastic shell very carefully and place the first prepared foam with CD hole. It is better to do this inside of the plastic shell because the plastic shell works like a shape. Afterwards take the second prepared foam with CD hole and place it as a second layer. That way you have a foam sandwich of 2 layers with a height of 10mm / 0.4 Inch. 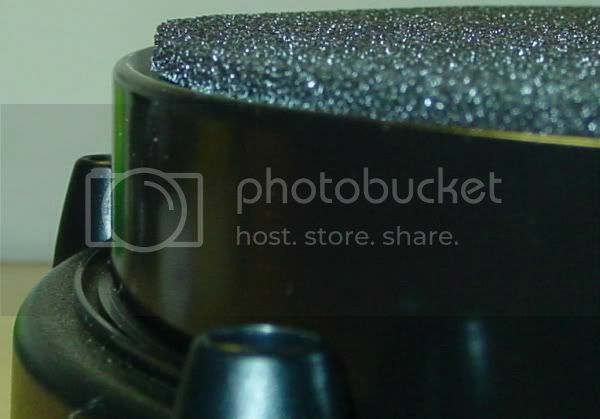 Move the sensor plate with the rubber to the center of the pad. Afterwards place the prepared foam on top. As you can see, the foam is a bit higher than the edge of the plastic shell. That’s necessary, because after placing the mesh head on top, the foam becomes a bit compressed and in turn it is providing the permanent contact from the mesh head to the sensor plate. At first place the mesh head on top of the pad and press it a bit down. Afterwards place the rim and do the tension very smooth. Than do it criss-cross untill the mesh head has an entire contact with the foam underneath. Do the final tension reflecting your liking and playstyle with the drum pad mounted on the rack and connected to the module. If you receive misstriggers on the mesh head playing close to the rim and you are not able to eleminate them via the settings, you can fine tune the tension by using a stronger tension. For myself I’m prefering a hard tension. The bolt is nearly plain with the plastic bottom that keeps the nut. That gives me a very good rebound to play rolls, ghost notes etc. Q: 10mm / 0.4 Inch as space between both triggers seems too less for me. Do they hit eachother ? A: No, no way. I did the blacksmith-method to the pad and did not receive any rim triggering as I hammered on the drum head. Furthermore I did 2 gigs with the converted pads. Everything was absolutely fine. Q: Why do you use 2 thin layers of 5mm / 0.2 Inch foam instead of one piece of 10mm / 0.4 Inch ? A: Saving money. The Adam Hall foam roll was big enough to allow it. On the other hand I did not find any other foam that comes with that size and condition of being fluffy and stable the same time. Q: A foam slice of 5mm / 0.2 Inch underneath the mesh head seems too less for me. Do I hit the sensor plate with the rubber on it ? In addition why is there no hole in it ? A: With a “normal playstyle” you would not hit the sensor plate, only if you play very very hard and weird. But this is not necessary because you get the maximum loudness much earlier. And if you hit the sensor plate with the rubber because you are very ambitious at that moment, it doesn’t matter. For that moment it feels like playing on an original and unconverted pad and you receive a harder rebound. The same time the produced noise is still dampened. I decided to use this foam without a hole. With a normal playstile I did not recognize any difference. 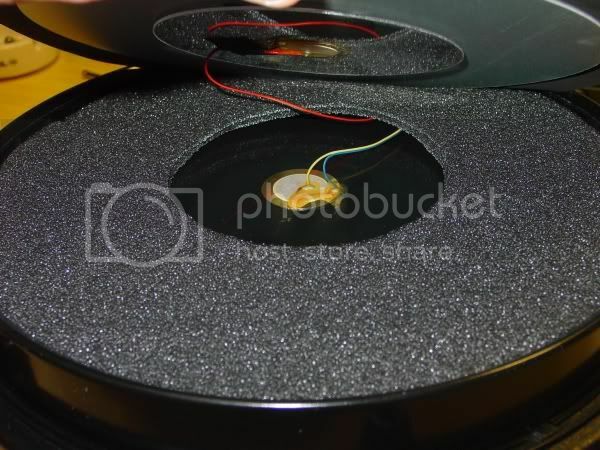 Using a foam slice with hole and playing very very hard and thereby hiting the sensor plate with rubber, the produced noise was not dampened and sounded like an original and unconverted pad. Furthermore I’m using a hard tension. I never hit the sensor plate. Q: Can I use any other foam and do the conversion the same way ? A: You can give it a try. But please understand that I cannot promise you the same result and I cannot do a remote diagnosis. The best would be to go to a music store selling foam to cover the front of loud speakers. Check the condition of this foam and compare it with foam you can buy. Q: Can I take the foam that comes with the pad, cutting it in two slices and afterwards adding some funky foam / EVA foam to it to lift up the whole foam sandwich ? A: You would not get a plain surface by cutting foam in slices not even using a sharp box cutter. Keep the original foam and if you decide to sell your drums you can replace the original condition. Q: Just a funny question. What can I do with the mylar heads after the convertion ? A: Turn them around and place them onto the converted pads. With that you got the best looking dust cover you’ve ever seen. The first video compares the produced noise playing on the converted pad with mesh head. Some hits are very hard to show you the maximum loudness. The second video shows you the performance of the converted pad as a snare drum. I used the settings mentioned at the beginning. The selected drum kit is “072 Funky Drmr”. The sound cable is connected from the DM10 to the 10 year old video camera. Some hits are very hard to show you what maximum and oversteering you get even using the linear curve. Nice description of your mesh conversion Gerdy. I'm sure many will find it very helpful! I think I will sticky this topic. Thanks for sharing Gerdy. Why my ears ring & why I'm going edrum! Bravo! We got the HF method & now the Gerdy method for the new 12" pad. Gerdy, your visits aren't as frequent as others, but your contributions are enormous. Thank you. DM10 Studio 2011, BBII mesh conversion w/ resistors left in place, Simmons DA200S, ProMark 7A nylon, Sennheiser HD280 headphones, Gibraltar rack, Camco double pedal. Fantastic stuff Gerdy - A very good and well thought out post, many thanks for sharing this information. Right time for me to start thinking about buying the new 12" pad!! Bravo! I see no reason that this method would not work for the smaller drums as well. The softer, less dense (fluffier :| ) foam reminds me of Hellfire's poly-fill method. One of my favorites to date. Great conversion Gerdy, and thanks for sharing. I am thinking about trying it so I'm looking into sourcing what I'll need. [Edit: ignore this, I corrected myself in the next post] Something baffles me at the moment - I must be missing something... The original grey foam is approx 20mm, is this right? That's what it is in my 12" pads. So you remove that and instead you add 3 x 5mm foam which is 15mm. So you are losing 5mm, yet your photo shows you have created extra lift, how can that be? I think you had the 5mm foam already but if you had the choice (I don't have any foam so I can get exactly what's required), instead of 3 x 5mm foam, would adding 2 x 12 mm foam be likely to work well? One layer beneath the sensor plate and one layer above. This would give 4mm extra lift to make contact with the mesh head. The entire stack can be lifted in this way instead of using funky foam. What do you think? How are the 12" pads compared to the 10" pads? Both before and after the conversion? I'm thinking of feel, bounce, responsiveness, hotspotting etc. Now that there is a nice recipe for mesh head converting a 12" pad, adding a 12" is suddenly an interesting option..
@trondster, out of the box the 12" pad is way better than 10" for response and playability, also marginally quieter. It still needs the mesh head conversion though because of the mylar heads and there's only a thin layer of foamy rubber between the head and the metal sensor plate. I'm not sure if I just need to play around with the settings to get the 10" playing as good as the 12" but so far I am getting on better with the 12". So going on what I have found so far, if space is not the primary concern, then if I were you I'd get the 12" for snare. It would be worth getting some more opinions on the relative playability of 10" vs 12". ..But to get a pad to convert - does anybody know somewhere you can buy a 12" pad in Europe? ...would adding 2 x 12 mm foam be likely to work well? One layer beneath the sensor plate and one layer above. I don't see where this concept was addressed, but I would think that in principle, the farther down the stack the piezo goes, the less sensitive it becomes. This is why some desolder their resistors. Chime in, please, if I'm misunderstanding or applying the theory. So if true, I'd prefer to try this method with a 2/3 total needed below the plate, then the other 1/3 above it. 1) How much foam thickness behind the mesh do you need beyond which no more foam will improve noise? 2) From what depth of foam thickness does sensitivity begin to deteriorate significantly? Do we have a happy zone between those two thicknesses, wouldn't that be nice? This would allow us to select the perfect foam thickness. I can comprehend your intention. But I think you are neglecting some other important factors. I do not think that we can create a “foam formula”. There are to much individual factors. And finally how about the playstyle of each drummer ? That's the next individual factor. I did the Hellfire conversion to the 8” and 10” pads and used my method for the 12” pads. All resistors are not removed. The tension on the 8" and 10" pads are a bit harder than on the 12" pads. After tweaking all settings I can play on all pads in the same way. Curve Linear for the snare and Log1/2 for the toms. As I have seen, a lot of e-drummers do not pay attention to these parameters. A lot are trying to set the dynamic only by using Sensitivity and Curve which is affecting all kits (and afterwards are wondering why another selected kit feels different). Some (new) e-drummers think that an e-drum kit is easier to setup and to tweak. Wrong. You can compare it in most situations with an acoustic kit. It took me more than 10 years and 3 acoustic drum kits to find my individual liking before starting my career in a huge band in 1990. Don’t ask about the time (and money) to go through different drum heads, resonance skins, sticks, bass drum machines, hihat-stands etc. And in addition I had to tweak and dampen my drum set in each situation. In the rehearsal room, at the recording studio and on stage (I was always the first band member who was setting up his gear). Ahhh…positioning the mics…also very nice…you thought you are done and during the sound check you are forced to set them up again. And now let’s look to an e-drum set. Forget the illusion to receive an “out of the box and ready to play” drum set. You can do so many things wrong. It starts with an incorrect setup and ends with the settings of the drum module. The secret is: Identify yourself with your drum kit, dive into it, take your time and tweak it. And after that you have to tweak each selected drum kit to your likings. @Gerdy. Thanks for providing your insights in such detail. You are right, I am over-simplifying it:- of course I am just a beginner and still optimistic . So to save me learning the hard (and expensive and slow) way, I do appreciate the wisdom being shared on this forum and the fact that you and others make this so accessible to the likes of me. Anyway, I ordered the 5mm Adam Hall foam to convert my 12" pads...in a 2m x 1m sheet there will be enough to experiment with the other size pads too. I will report back. About the band you joined in 1990, were they/you well known? The band became famous mid of the 90’s in southern Germany. All band members were brilliant musicans and we stood as a compact unit on stage. I had to leave the band in 1999 because of a mission in Kosovo (former Yugoslavia). I’am a soldier since 1987 and last year I came back from my meanwhile 8th mission. Next mission is planned next year which is going to be my third mission in Afghanistan. There is no way of being a drummer in a professional band for the next ten years (until I’am going to retire from active duty). NK_Drummer, please let’s go back on topic or otherwise we would spoil this thread. Let us look forward on your plan in doing the mesh conversion. Remove "craft foam" from original Hellfire mod. Remove "mouse pad like foam" that's glued to metal plate. Put New thicker evo foam on top. No sensitivity changes made. Works fine. Good point at the end. There's no difference. Technology is SUPPOSED to make your life easier. Think again. It's just ANOTHER tool. No magic involved. Has anybody in the US sourced this "adam hall foam" stuff locally ? my googling for this product only seems to find vendors located throughtout Europe. I found some places in the US by searching around for "speaker foam" or "acoustic foam" , but these all seem to be sold in US thicknesses (ie 1/4" , 1/2") . 5mm converted to US is like 0.20" (just under 1/4"). I'm not sure if the US product is just rounded for convenience's sake or if it is in fact 0.05" thicker than what is required, and if so, whether this small amt would affect the mod results in any signficant way. I would venture to say that it wouldnt hurt it any as long as you have the holes appropriately cut and the plate(s) can resonate. If it equates to a wee bit more thickness, the head will pull it all together and make it a bit firmer. Worst case would be you have to adjust your sensitivity levels. When I inquired as to whether they knew if this was comparable to the Adam Hall product, the response I rcvd was "Since we are the same exact type of company in the US, I would suggest you look at this part, which is really the same type foam that we sell to all the US makers of speaker cabinets." because of a suprisingly nice bonus from work I sold my DM10 Pro and upgraded to a DM10X. I did a full mesh conversion with Billy Blast 2 heads using HF method on 8 and 10's and this method on the 12's, using the 1/4" TCH foam. Keno, is there enough foam on (1) roll to do all (3) 12in. heads? I just started this mod except my 12 inch pads have wood shells an uses 2 layers of 10mm foam underneath the resonating plate interestingly the top layer of he foam has the cd sized hole in it already. Therefore all I have done is added a layer of the 5mm acoustic foam on top. as I have noticed you are using a DM pro kit. The 12" pads from the pro kits have more space inside and are of the same foam arrangement like the 8" and 10" pads. You can do the hellfire mesh conversion with your 12" pads. 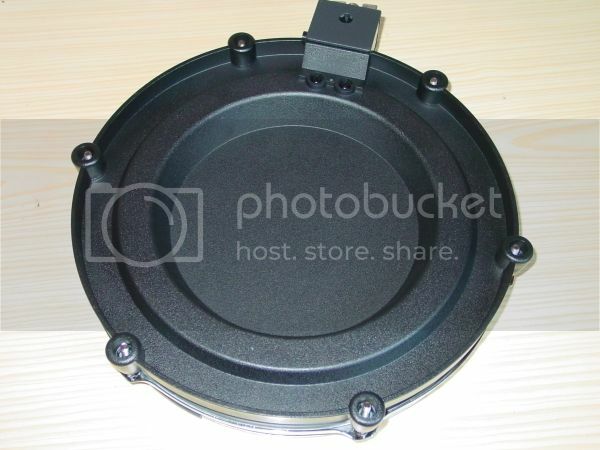 This mod is for 12" pads from the X kit, they have less space inside. I mentioned that at the beginning of my post. I'm toying with the idea, hmmm. Should work out at about GB£12.00 per head then. Just gotta pluck up the courage to do it I suppose!